Help Organize your Medications and Remind you to Take the Right Dose at the Right Time. Easy-to-use Pill Organizer System with 4 LOUD Daily Voice Alarm Reminders. 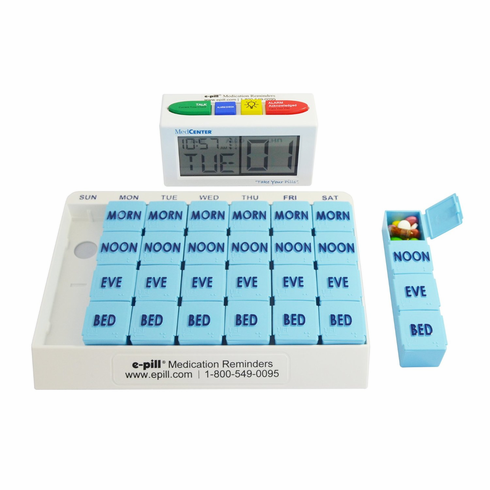 The e-pill Medcenter LOUD Talking Alarm Clock and Medication Reminder with 7 X 4 Large Capacity Pillbox will help organize your medications and remind you to take the right dose at the right time. Up to 4 daily voice alarms. Simply press the red ALARM Acknowledge button to shut off the alarm. Alarms will automatically reset and go off at the same times tomorrow. Each pillbox has 4 large pill compartments (4 doses per day) labeled MORN, NOON, EVE, and BED. Pill capacity: 18 aspirin sized tablets fit in each daily compartment (up to 4 compartments per day). Alarm duration: 60 minutes (or until "Alarm Acknowledged" button is pressed).